← Does “Reading” Mean You Have to Say the Words Out Loud? I was back in my home state of Minnesota recently visiting my family there. One day I went into a diner located in a small town just outside Minneapolis. A diner is a restaurant that usually has breakfast food served all or most of the day, plus hamburgers, salads, and sandwiches. It is a very informal restaurant, popular originally in the Midwest (where Minnesota is) and Northeast parts of the United States, but nowadays (right now, at this time) found in almost any city or town. Many diners are open 24 hours a day, so you can have breakfast right after leaving the dance club at 2:00 AM (I did that when I was younger!). I like this particular diner I visited on my trip because it was like “stepping back in time,” that is, going back to some previous time in history. The prices for breakfast were very cheap, perhaps half what it would cost you in a regular restaurant in Minneapolis. How cheap? You can order eggs, toast (bread), and hash browns (potatoes cut up and fried in a pan) for only $4.35. That meal would cost two or three times that amount in Los Angeles! 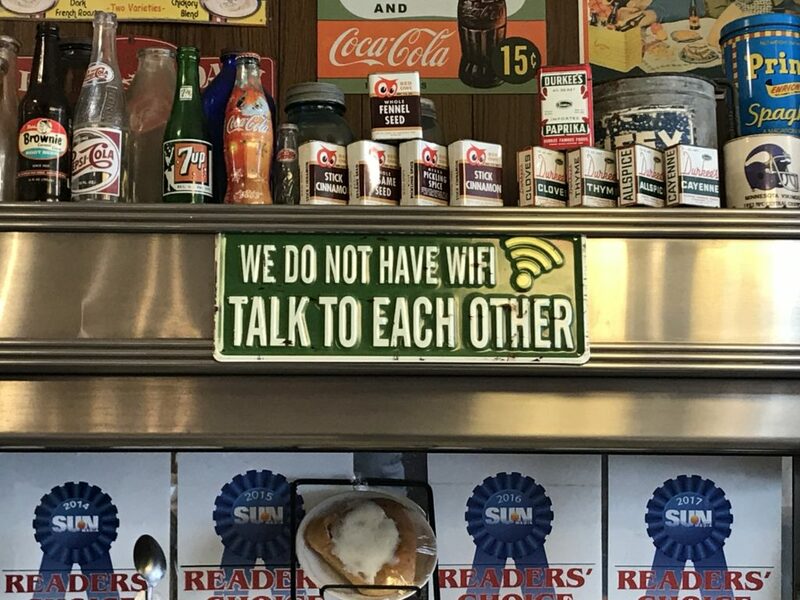 WE DO NOT HAVE WIFI. Of course, we all know that when you go to a restaurant nowadays, you will see at least half of the people – children, teens, adults – looking down at their smartphones instead of talking to one another. My guess is that smartphones, as a new technology, are a bit like automobiles in the early 20th century. When cars were first used, there were few rules and a lot of dangerous driving. Eventually, however, people changed their behavior and started to drive more carefully. Will people eventually (someday) change the way they use their smartphones? I hope so. Next time you are with another person, try to NOT look at your phone, and talk to the person instead. You might just enjoy it! Want to comment on this blog post? You can now do that on our Facebook page – click here to comment on this post! This entry was posted in Life in the United States. Bookmark the permalink.